AD PRO was selected by the SBA to undertake a historic project - the establishment of an authentic photo bank of American Indians in real business settnigs. Our team traveled from corner to corner of the U.S. visiting both urban and reservation based American indian owned businesses at their place of business. 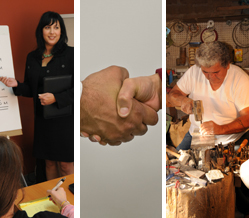 These photos are now used by the SBA in their outreach and educational materials regarding programs targeted at Native America. 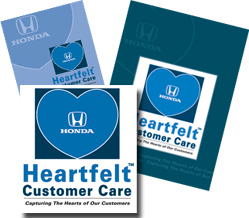 Upon being awarded this design and internal incentive program project from Honda, AD PRO researched the philosophy of Soichiro Honda, company founder, who spoke of "heartfelt acts" on behalf of customers. Using this platform the name of this incentive program, Heartfelt Customer Care, was born. AD PRO designed the logo at left,along with the program brochure, guide, lapel pin and other collaterial materials. We assisted Honda's internal dealer marketing team in the program launch at an annual dealer show. AD PRO also designed a custom award plaque, manufactured the plaque and coordinated the program deliverables to dealers who met the award's criteria. the SBA in their outreach and educational materials regarding programs targeted at Native America. AD PRO is proud of our long-term relationship with American Honda Motor Co., Inc and our work history on their corporate supplier diversity exhibit. Pictured far left is our first version of their display with dual "pop-up" exhibits. 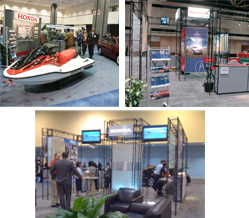 We then developed a truss system, that can be easily updated providing a dramatic/high-tech foundation for communicating and facilitating interaction between Honda and conference attendees.